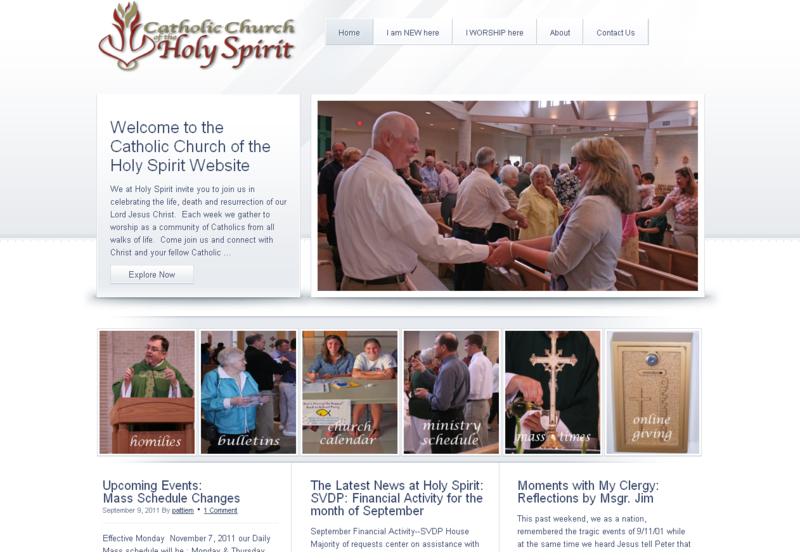 Recently completed for the Catholic Church of the Holy Spirit in Pensacola, Florida, this design spans 73 pages with the latest WordPress plugin technology including recorded homilies, contact forms, location maps, embedded calendar, events calendar and videos. 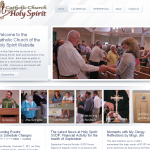 This ground-breaking website is the first of its kind in the Diocese of Pensacola-Tallahassee. Designed to engage the members of the parish from the moment they land on the home page, this website offers easy access to all of the information needed for ministry participants, weekly bulletins, Mass times and online tithing. Take a look at this modern, engaging website by clicking here. Update your website with fresh images and content. Visitors to your site want to be engaged with new information and experiences. A static, non-changing website means certain death to your traffic flow. Do not have a website? Get one. If you have a business, sign up for a domain and put up a site (even if it is a “canned” package site – some presence is better than none at all). If you do not have a business, put up a personal site with a <your name>.me domain. About.me is a great place to put up a free one-page site about yourself. Facebook currently has over 800 million users, with the average user being connected to over 80 community pages, groups and events. This is a huge market for anyone who has a product or service to sell, a story to tell, or a call to evangelize. The best way to showcase your product, service or cause is to create a Facebook Fan Page. A fan page allows you to get your message out to the millions who use Facebook daily and encourage them to “like” your page so that the message spreads to their base of friends. The basic fan page is free with hundreds of options to enhance your page by using third-party software. Google Plus is a relatively new player in the social network services game. However, in its short existence, Google Plus has already amassed 44+ million users. The Google Plus claim-to-fame is its ability to allow you to divide your community of friends or contacts into “circles”, so that you can target specific messages and content to certain groups of people (e.g. friends, business contacts, association members, sports clubs, etc.). By placing your business, organization, or your personal profile on Google Plus, you increase your likelihood of connecting with others by moving up in the Google search rankings, giving you another platform on which to be found on the web. Best of all, like Facebook, Google Plus is free to use. A LinkedIn profile is an absolute must-have if you are a business professional or team member of any organization. With over 100 million users on LinkedIn, you are bound to network with other professionals who share your interests. Plus, LinkedIn allows clients or colleagues to write and post referrals on your work, giving you instant credibility for other members who might have an interest in working with you. Since LinkedIn is a professional networking site, you have the opportunity to list all of your accomplishments at work, in civic organizations, and from school. LinkedIn is an online resume of sorts. Google does rank your profile and you will turn up in search results. By adding certain keywords and location words, you can increase your visibility on Google. Professional and association sites are a great way to enhance your online presence. Many of these sites allow you to post a profile about yourself or your business and allow others to rate your work and your expertise. Look for professional sites with your industry. For example: if you are a lawyer, you might consider joining LawLink or Legal Onramp; if you are a doctor, consider joining AVVO; if you are a real estate agent, consider joining ActiveRain. All of these sites are geared towards showcasing your expertise and increasing your search rankings. Choose one of the above action items and get busy creating your page or profile. Remember, being found online is a numbers game, both in quantity of locations and quality of content. By updating your website, coupled with joining social networking sites and professional or association sites, you will enhance your online presence.